George Parker FitzGerald (1843–1917), businessman and politician, combined a flair for business with an interest in radical politics, a rare combination in nineteenth century Tasmania. He was the colony's leading innovative retailer and one of its most outspoken parliamentary supporters of the working classes. Born in Hobart, FitzGerald was educated at the elite Hutchins School, and was sent to Sydney to prepare for a business career. 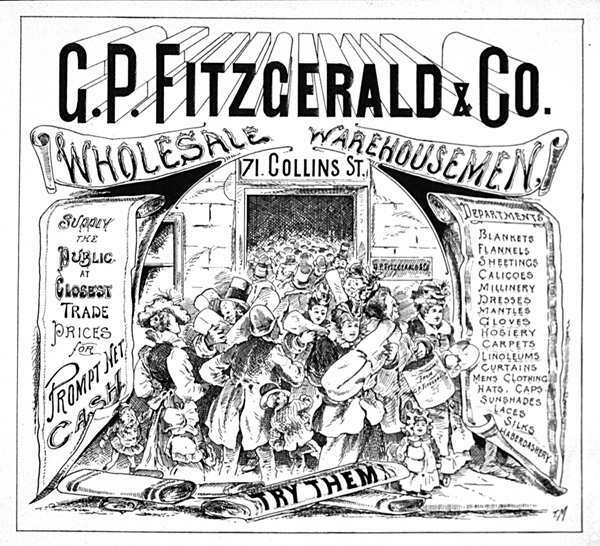 Returning to Hobart, he established his own general merchandise shop, GP FitzGerald and Co. In the 1880s he was elected to the House of Assembly, and played a prominent role in the liberal reform movement led by Fysh and Clark. This challenged the entrenched power of the landed gentry who had for decades exercised a stranglehold over parliament. In 1887, FitzGerald became a member of Fysh's government, and helped to modernise politics by sponsoring reforms including payment of members of parliament, the legalisation of trade unions and the expansion of public services. He championed the eight-hour day and technical education. Losing his seat at the 1891 elections, FitzGerald turned his attention back to business. Amid severe economic depression, he established the first emporium-style retailing firm in Tasmania, building on innovative practices of cut-price, cash-only sales underpinned by extensive advertising. The last years of his life saw FitzGerald enthusiastically backing Australia's involvement in the First World War while exploiting the business opportunities it opened up. He died in 1917, remarking to his son that he hoped he had built up 'the best business of its kind in Tasmania'. Further reading: Q Beresford, 'G.P. FitzGerald', THRAPP 28/2, 1981.